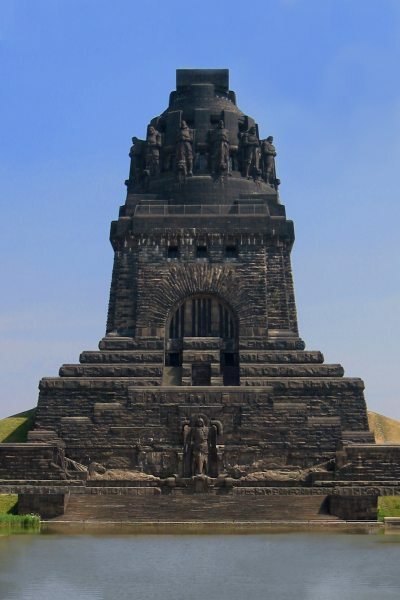 Shows you, not only the former brown coal area, but also a delightful landscape, cultivated by man, and the memorial area “The Battle of Leipzig 1813�? (also known as the Battle of the Nations). You experience the greatest change of a landscape in Europe: The reorganisation of a former opencast mining area into a modern recreational area, the Leipzig “Neuseenland” (Leipzig “New Lakeland”). At the end is a visit to Lake Cospuden with its beaches, restaurants and surfing and sailing facilities. On request also with a boat trip on the lake Cospuden or a visit to the Romanesque Emmaus Church, a fortified church from 13th century, which was (because of the opencast mining activities in that area) “moved” in 2007 by a 12 km long spectacular transport on a low - loading vehicle from the abandoned and deserted village of Heuersdorf to the town of Borna. Follows the traces of the battle of October 1813. You become acquainted with the Battle of Leipzig Monument, the Russian Church and other memorials of the battle in the South of Leipzig. Shows you the transformation of this area after the change of power. First you see the large developments: the New Fairgrounds, the mail order house Quelle and the BMW factory. Via the new four-lane motorway, you travel past the open-cast mines of the North to the freight traffic centre, the trade park and the Porsche factory, where the prestige car Cayenne is manufactured. Then you continue on to the intercontinental airport Leipzig/Halle. You return to the town centre past the sports centre and the Waldstraße district. Takes you, via Leipzig Grünau and Markranstädt, to the Gustav-Adolph memorial in Lützen with a memorial chapel and museum. Next, you visit the village Röcken, the birthplace of Friedrich Nietzsche, with a museum in the house where he was born, the village church, grave and the „Röckener Bacchanal“ of the sculptor Klaus F. Messerschmidt. Then past the adventure park Belantis to Lake Cospuden and back to Leipzig. To the Luther Memorials in Wittenberg. 1517: Begin of the Reformation. Martin Luther hangs his 95 theses on the door of the Castle Church in Wittenberg. 2017: The world celebrates the 500th anniversary of this event! The day tour leads through the beautiful national park “Dübener Heide�? to the Luther town Wittenberg. There you visit, in particular, the Luther memorials: Luther House, Melanchton House, Castle Church and Town Church, which were included in the World Cultural Heritage in 1996. Of course you also see the castle and castle courtyard, the Cranach Houses with their inner courtyards, the Beyer Courtyard, the market square with town hall and the Luther and Melanchton memorials as well as the famous Luther Oak. If desired, also the Hundertwasser house, the last work of Friedensreich Hundertwasser. The tour can also be combined with a visit to the Wörlitzer Park. with Wörlitzer Park: 8 to 9 h.